Etain Tannam is Lecturer in International Peace Studies, Trinity College Dublin and Coordinator of the MPhil (Masters) in International Peace Studies. . She received her BA in Economics and Political Science from Trinity College Dublin, her MA in West European Politics from University of Essex and her PhD from London School of Economics and Political Science. She has had long standing expertise on the impact of the EU on cross-border cooperation between Ireland and Northern Ireland and on the British-Irish bilateral intergovernmental relationship, publishing a book based on her Phd research in this area, in 1999. She is author of British-Irish Relations in the 21st Century, 2019, forthcoming, Oxford, Oxford University Press, International Intervention in Ethnic Conflict: a comparison of the European Union and United Nations (Basingstoke, Palgrave) and Cross-Border Co-operation in Ireland (Basingstoke, Palgrave) and has published various book chapters and international journal articles. 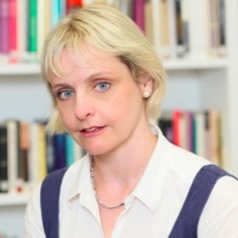 Her main research interests are Brexit’s implications for British-Irish relations and cross-border cooperation, the EU and conflict resolution and international relations theory. She has presented as academic witness to the House of Lords Brexit Inquiry: Northern Ireland and to the European Parliament’s Legal Committee, JURIS, as well as submitting evidence to the House of Commons Foreign Affairs Committee (inquiry on the UK’s bilateral relations in the EU after Brexit). Sheis also working on various projects to mark the 20th anni9versary of the Good Friday Agreement in April 2018: ‘Beyond the Good Friday Agreement: the 20th anniversary of the Good Friday Agreement’, Ethnopolitics, April 2018, ‘The Impact of the Good Friday Agreement on Administrative and Intergovernmental British-Irish Cooperation’, Ethnopolitics, in Beyond the Good Friday Agreement: the 20th anniversary of the Good Friday Agreement, April 2018 ‘The Good Friday Agreement and Political Cooperation’, in Irish Political Studies, vol. 32, no. 2, June 2018.